A hypnotic pianoline with the incredible skills of Sax Max show us the jazzy life of Parov Stelar. Released last year I still can't get enough this groovy tune, taken from the Monster EP. Parov Stelar aka Marcus Füreder, a musician who lives and works in Linz among the thriving Austria music scene. 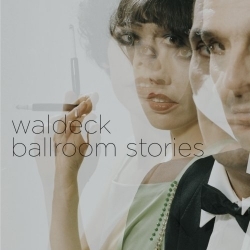 I was dining in a Polish restaurant last night with a beautiful lady, delicious food, wonderful wine and Waldeck's album, Ballroom Stories  was playing the background, a perfect accompaniment to chilled out evening. This tune captures the vibe of the album, luxurious melodies, jazzy trumpets swing along with the skanking beats, topped off with silky smoky vocals. Klaus Waldeck, a former copyright lawyer is a driving force in his native Austria’s burgeoning electronica scene, Waldeck is a proponent of the Vienna Sound along with Kruder & Dorfmeister, Count Basic, Tosca and dZihan & Kamien.